Mid Life Crisis or Growing Up? I can’t decide. I have decided to let my grey hair grow out. I had my first grey hair at 21. I was shocked. At least 10 years ago I started coloring it. For the last couple of years I have toyed with the idea of growing it out. Last Tuesday I committed. I told my wonderful hair stylist what I wanted to do and she is totally on board. Why am I doing this you ask? Good question with not a very clear answer. I am tired of spending big money every 8 weeks to color my hair. Especially when I need it done every 4 weeks. It is costing a lot of money which I am not comfortable with. I have always loved silvery white hair. I think it comes from my kindergarten teacher Mrs. Vallow (who is now Mrs. Latin, who by the way I still exchange Christmas cards with. How cool is that!) She had lovely white hair. And I loved her. My maternal Grandpa had lovely white hair. And by the looks of it I will have silvery white hair too. I am 45. My children will be very happy that I know this. I really can’t be bothered to pay attention to my age unless it is divisible by 5. So when my age is finally divisible by 5 I don’t have to ask them how old I am! Of course I will now be 45 for 5 years until I can be bothered to pay attention again. Anyhow…I am not getting any younger. As I try to raise 2 girls in today’s world I start to ponder the image obsession we have. How all the magazines have photo shopped people. I wonder what the TV world would look like without people having stylists, and hair dressers, make up artists, hair color, porcelain veneers. I mean, really? What would we look like just being our beautiful selves? We don’t generally know what aging gracefully looks like. Everyone and their mother (and grandmothers too) seem to get their hair dyed. How am I setting a good example for them if I don’t accept my own body? I am curious. What would I look like? Some people rock white hair. Others look old and dowdy. Will I have cool white stripes on my temples? Will it be salt and pepper hair? Will I hate it and go back to dyeing it? All the chemicals…Ok that is a lie. I know it must not be good for me and I feel like ethically I should say that… but really.There are some things that you just do for beauty. I am going to keep painting my toe nails until the day I die and if I thought I needed to color my hair I would still totally do it chemicals or not. Truth. It seems like a good time to do it. As far as I can tell I have just sprinkles of grey everywhere except my temples. Those are pretty grey. If I wait too many more years I will have to do the whole “skunk stripe” grow out thing. And I am not sure I am strong enough for that. I bet you are asking yourself “What is she talking about mid-life crisis? Isn’t that when you start doing all you can to look younger?” Well…maybe. When I was 35 my Mom told me I was now middle age. I was very offended (sorry Mom). Since I am going to live in good health until I am 102 OBVIOUSLY I will not be middle age until I am 51. Right? Right. But as I pondered this going grey I started looking at other changes that have been happening over the last year. I started paying more attention to my weight and eating healthy. I am 90% gluten-free because I feel so much better that way. I am on a path to a grain free Paleo type diet. Because when I eat that way I feel so much better! I started jogging this year and ran in my first race. I do not like to run. I hated running in school. I hate to get all sweaty and out of breath. But I wanted to be more active. I found a race I would enjoy and the motivation to actually go out and run! I want to be healthy at 102, so I better start getting my rear in gear! I have started to quilt. Something I have really wanted to do for a long time, but never took the time for myself to do it. And I love it! It brings me so much joy. I have started to really concentrate on my faith. To think that I am not really LIVING my faith. Just going to church isn’t enough anymore. I want to KNOW more. I want to BE more. I want to look for ways to experience my faith in ways I have not been able to do before. I want to read more and grow. I want to connect with other women who are going along the same faith journey I am and to share that journey. I want to be more honest in my relationships. It became very clear to me recently that I have not been very honest communicating my true feelings. Which then leads to hurt. And loss of trust. This is not how I want to live. I need to learn to be true and authentic. And maybe that is the biggest thing of all. Being AUTHENTIC. Being true to who you are and who you want to become. I certainly don’t think people who color their hair, only go to church once a week and don’t jog are wrong. Nor do I want to judge them in any way. I truly think you should do what makes you feel most like your self. Whatever that may be. I have already told my Mom I will introduce myself as her older sister anytime we are together. 😉 It is really only about me. So am I having a mid-life crisis and changing up a bunch of stuff? This entry was posted in Family, Home, Life, Uncategorized and tagged Going Gray, Going Grey, Gray Hair, Grey Hair, Growing out the grey, Growing Up, Mid Life Crisis, Middle Age, Over 45, white hair. Bookmark the permalink. 14 Responses to Mid Life Crisis or Growing Up? I can’t decide. After reading a bit of information in a recent copy of the Mary Janes Farm magazine, going gray is a good thing to do, and yes, it’s because of the chemicals involved with hair coloring. It seems that studies have shown higher cases of cancer in women who color their hair. Not a good thing if you want to live to be 102. I don’t have the issue or the figures at hand but will happily look them up for you if you’d like me to. Several years ago, my younger sister wanted me to dye my hair because I made her feel old with all my gray. Given that we only see each other once or twice a year I decided it wasn’t worth the trouble. Since the Bible tells us that gray hairs are a sign of wisdom, I think showing them off is a good thing. As some would say, I’ve worked hard to get all these gray hairs. Enjoy the freedom from your hair appointments and use a little of the extra money to buy chocolate occasionally, the rest can go towards a nice vacation, the mission fund at your church, etc. I bet you’ll end up wondering why it took you so long to be yourself. I love Mary Janes Farm! Such a fun magazine. I know it is a good thing to do for my health. It certainly can’t be good. I will probably use the extra money for quilting fabric! Lol. Good for you! As a blond, i can’t see any grey yet, so i like to pretend I’m 36 or so ( rather than 44 *cough*). Except for one hair on my chin…. Only one hair on your chin. Wow. Good for you! That is one of the big things I have issues with. Whose idea was it to put hair on ladies chins just at the time they start needing bifocals and can’t SEE them!! It is just not fair! I mean one day you are fine. The next day you look in your 100x magnifying mirror and there is a chin hair an inch long. I object. I grew my hair out in my 40’s too, the main reason I did it, is that I was tired of having to hassle with having it colored. I too didn’t like having to pay big bucks to have it done. I am so glad I did because others I know had decided to do the same after seeing what my hair looked liked. 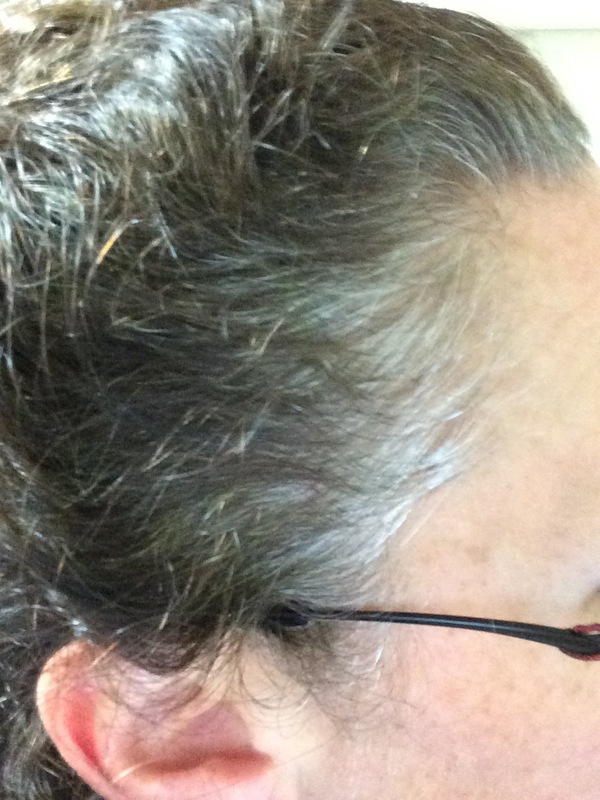 I like my hair, I call them natural highlights and I can thank my mother for graying gracefully (I take after her). I agree with ‘Hooked on Quilting’, I often tell people that gray hair according to the bible, is a sign of wisdom. I must be pretty wise. Or at least wiser than I knew!! LOL. I love your honesty and am looking forward to hearing more about your journey. It’s totally not fair that you have silver hair coming in at 45. I am turning 62 in November and stopped coloring my hair 4 or 5 years ago because of the cost/chemicals yet I still don’t have enough gray or silver! My sisters in law both decided to ditch the dye this year and I can honestly say that hey both look better for it, their features seem softer and they look younger too. Good luck with the process.